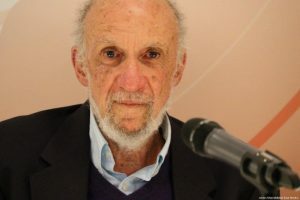 Two British universities have cancelled events planned for the launch of former UN Special Rapporteur for Palestine Richard Falk’s new book. The professor of international law was scheduled to speak today about his new book, “Palestine’s Horizon”, in Middlesex University. But the London based university followed a decision by the University of East London yesterday to pull the event at the last minute. Since the cancellation, a pro-Israeli activist group based in the UK has confirmed that the events were pulled following their “intervention”. Both events had been advertised on the universities’ events pages. East London University cancelled the talk, saying it took “the difficult decision” because “it became clear, the day before the event, that the University’s External Speakers Policy had not been adequately followed”. Middlesex University press officer told MEMO that “concerns over safety” prompted the decision to cancel the event, while also confirming that the event could be held in the future if safety concerns were met. While both universities cited logistic and procedural concerns as reasons for cancelling the talk, Campaign Against Antisemitism (CAA), which claims to be a “volunteer-led charity dedicated to exposing and countering antisemitism through the enforcement of the law” issued a statement announcing that their “intervention” forced the university to cancel the speech. Falk was the co-author of a new UN report which concludes that “beyond a reasonable doubt … Israel is guilty of imposing an apartheid regime on the Palestinian people”. Speaking at a MEMO event on Monday, Falk said the language around Israel’s occupation of Palestine must change if Israel’s claim to the land is to be seriously challenged and in order to move towards a more meaningful peace process. Rather than an “occupation”, which he views as an inaccurate term partly due to the length of time that Israel has now held on to the territories conquered in the 1967 war, he affirmed that instead Israel should now be called an “apartheid state”. Are the Clintons Israeli Agents? What Makes the EU So Rabidly Hypocritical?